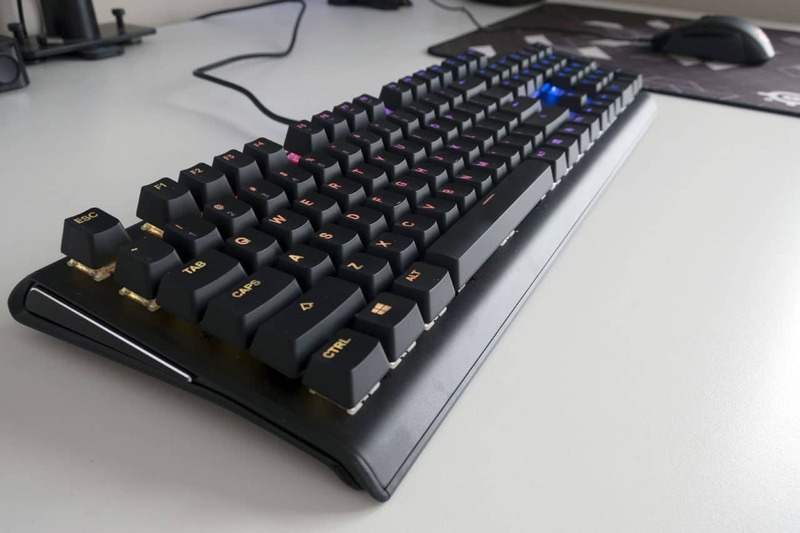 Are you thinking of getting a gaming keyboard but do not know where to start? With all the brands, features, and extra accessories modern keyboards offer, it is easy to get lost in the fanfare. Fear not, we are here to help. A comfortable and well-built keyboard can be the main difference between a fun gaming session and a frustrating one. Those that want stability, durability, and a bit of flair into it should look into the Apex M750 mechanical keyboard. The most prominent difference one can easily spot between a regular office keyboard and a gaming one is the lights. Yes, gaming keyboards these days offer brightly colored lights under each key. The Apex M750 itself has a vast lighting feature for every taste. These lights can either be for aesthetics only or function, depending on the user. You can also set certain lights to appear for Discord and other social media notifications. These may come as flashy to customers. I mean, not everyone needs light notifications for their Discord chatrooms. The lights, however, have a more serious purpose. Ignoring all the patterns, color combinations, and modes the lights offer, they essentially provide instant and reliable illumination for each key. If you have played games in the past, you may have done them in the dark. Dimly lit rooms can create spectacular ambiance when playing games (especially the horror genre). Dimming the lights enhance the visual experience you see on your monitor. It also removes all distractions from the outside world, giving full attention to what is happening onscreen. However, with the room dark, it can be difficult to find a specific key to press. When it comes to games, every button has a different function. Pressing the wrong one can be disastrous, and can make the game more frustrating than fun. Video games often require fast and accurate button pressing to maneuver through the levels. Having a keyboard that has each key lit up eliminates any accuracy error experienced while playing in the dark. Let us face it – every player has experienced rage and frustration while playing a game. Most of the time, people often let out these emotions through their poor keyboards. They sometimes smash the keys, or at the very least, press them repeatedly – and heavily. Come on, you know you have done it before. A durable keyboard can take the abuse any player can dish out. The Apex M750 does just that – with the help of its aluminum casing, steel components, and heavy-duty keys. Outside players raging, accidents can also happen around your keyboard. They can drop from the table, or something can fall on them. Having a stable and strongly built keyboard makes surviving the incident possible with the minutest of damages. The mechanical keys also add to the longevity of your keyboard. These mechanical keys can withstand over 50 million clicks. That is enough to last a lifetime – or a good number of years for the dedicated video game player.